Click HERE to join the neighborhood association or donate to support the neighborhood – it takes 1 minute! Welcome, neighbor or friend! Whether you are looking for a new place to call home in Indianapolis, or are a current resident of Herron-Morton Place, we welcome you to our website. Here, you can find the most up-to-date information about what is happening in and around our historic neighborhood, our history, meeting notes, pictures of past HMP events, a listing of neighborhood-area charities and businesses, and many ways that you can get involved to help make Herron-Morton Place the best place to live in Indianapolis. 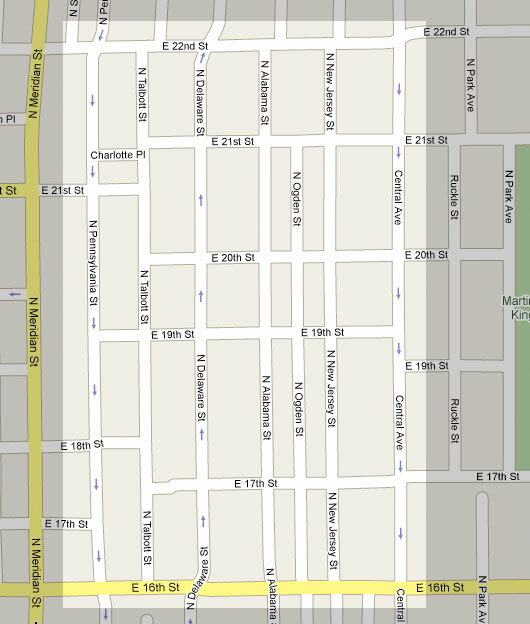 What are the HMP Neighborhood Boundaries? From the north side of 16th Street to the south side of 22nd Street, and from Pennsylvania Street to Central Avenue.